The new government initiative ‘4 million trees in 4 years’ was launched today by President Jioji Konrote at the State House. While officiating at the launch, Konrote says this initiative builds on the United Nations 2030 Agenda for Sustainable Development particularly the SDG 15 and supports the New York Declaration on Forests which aims to end natural forest loss by 2030. Konrote says the initiative will see the planting of trees such as timber, fruits and ornamental trees. 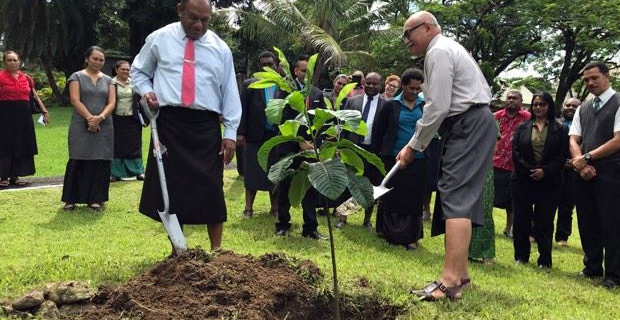 He says that Fiji’s forest cover will increase exponentially, which could only mean that as a nation, we will be able to help with the greening of our towns and cities, maintaining and protecting our forests and pristine natural environment, reducing soil erosion and siltation, offsetting some of our carbon output and contributing to climate change mitigation and adaptation. Konrote adds that this is not only an initiative that reflects visionary leadership on the part of Government, but it also reflects a deep sense of responsibility that we could leave our beloved nation in a better state than when we found it.